As the children's books editor for Harper & Row for over 30 years, Ursula Nordstrom was a key figure in the careers of many children's literature greats, including Maurice Sendak, E.B. White, Margaret Wise Brown, and Charlotte Zolotow. Despite her role in publishing well-known books, she only published one children's book herself - The Secret Language. I have been wanting to read this book since I read Dear Genius, the published collection of Nordstrom's correspondence, and I was so pleased to stumble upon a paperback copy at a used book sale. I am pleased to share The Secret Language as today's Old School Sunday title. When Vicky starts boarding school, she feels very much like an awkward outsider. Certainly none of the other girls step forward to welcome her, and being away from her mother for the first time is very difficult. When she meets Martha, however, she finds a kindred spirit. Both girls are content to be unusual, and soon they are sharing everything: a dorm room, their own outdoor hut, and a secret made-up secret language all their own. Though neither girl ever truly learns to love boarding school, they come to care enough for each other that they might just willingly come back next year anyway. What is most refreshing about this book is its honesty about the girls' unhappiness at school. Nordstrom does not try to sugarcoat the boarding school experience, or even redeem it through the events of the story. Instead, she focuses on the unique friendship that makes school tolerable for both girls and explores the psychology behind the two girls' admiration for each other. Rather than indulging all the dramatic plot lines that come to mind when contemporary writers discuss female friendship, she delves deeply into these two specific characters and simply follows their feelings where they lead, focusing on the small moments and shared confidences that build up their connection to each other. Apparently, Ursula Nordstrom wrote a sequel to this book, which she shared over the telephone with Charlotte Zolotow, but then subsequently burned before she died. While I suppose I understand the desire to remove all evidence of a piece of writing she didn't feel was up to her standards, I am so disappointed that we don't have anymore of her wonderful books to read all these years later. 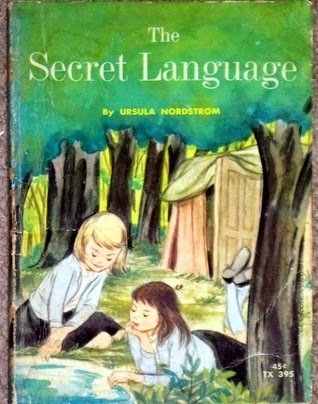 While The Secret Language is not as memorable as some of the more well known award winning books of the time period, it does highlight Nordstrom's respect for the emotions of children and her desire to provide them with relevant and well-written pieces of literature. The Secret Language embodies all the sound advice she gave to the authors for whom she served as editor.